JERUSALEM (JTA) — Israeli police evacuated the synagogue at Amona in the West Bank, the last occupied building in the outpost. 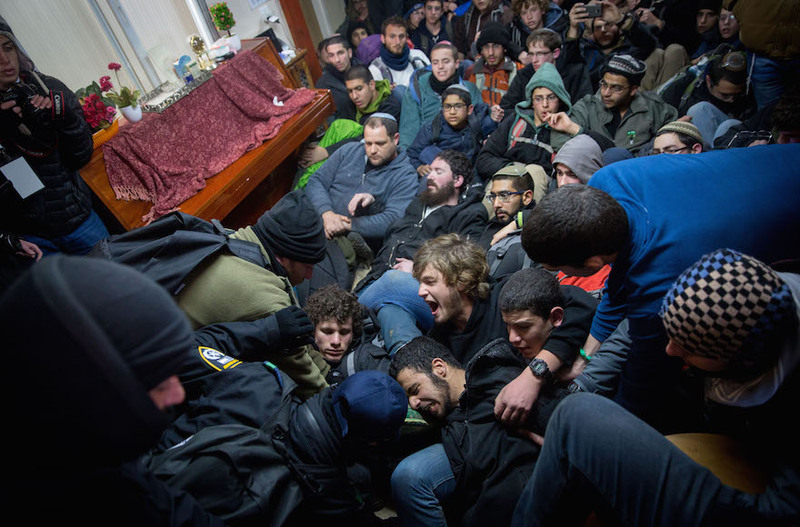 Up to 100 people, mostly teens, were holed up in the synagogue when it was evacuated early Thursday afternoon, several hours after the last of the 40 homes in the outpost were emptied of hundreds of protesters in an operation that began about 24 hours earlier. Police and security forces needed nearly an hour to break through barricades on the synagogues doors and windows erected by the protesters, including corrugated metal sheets, wooden planks, piles of rocks, and stacks of the synagogue’s tables, chairs and movable dividers. Eight police officers were injured during the evacuation of the synagogue. Thirty-two police have been injured in the 24 hours of the operation. Some of the protesters walked out of the synagogue on their own, but most were carried out by police. One protester screamed at the police carrying him that they were acting “just like the Germans did” during the Holocaust. The protesters were pushed on to buses waiting to take them away. No timetable has been announced for the demolition of the buildings. Hundreds of police entered Amona on Wednesday morning to carry out the court-ordered evacuation. The February demolition was postponed from Dec. 25 to give the state time to provide new housing for the residents. Israel’s Supreme Court on Wednesday canceled a December agreement by the government and the Amona residents to move their community to land adjacent to the evacuated outpost after Palestinians came forward claiming ownership of the land. The Supreme Court had ruled previously that Amona is an illegal settlement built on appropriated Palestinian land. At least three demolition orders had been issued since 1997. On Wednesday evening, Israeli Prime Minister Benjamin Netanyahu announced that a new West Bank settlement will be established for the evacuated Amona residents. It will be the first new West Bank settlement established in 25 years. In 2006, a confrontation between settlers and police forces attempting to evacuate them turned violent, leaving many injured.